YEREVAN (RFE/RL)–The National Assembly approved Tuesday a government bill that will make it easier for Armenia to annul its normalization agreements with Turkey if Ankara continues to delay their ratification. 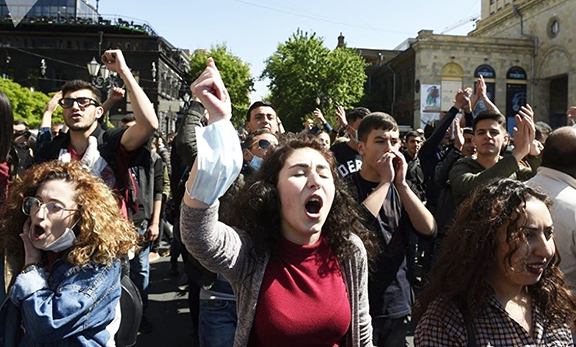 The relevant amendments to an Armenian law on international treaties envisage the suspension or termination of agreements signed by Yerevan before their entry into force. President Serzh Sarkisian announced his intention to enact such amendments in December in response to Turkish leaders’ continuing statements making the ratification of the Turkish-Armenian “protocols” conditional on the resolution of the Nagorno-Karabakh. He made clear that Yerevan will walk away from the deal if Ankara fails to implement it within a “reasonable” time frame. The parliament overwhelmingly passed the amendments in the first reading, with only one of its factions, the opposition Zharangutyun party, voting against them. Zharangutyun lawmakers, who have been strongly opposed to the protocols, said Armenian law and international conventions signed by Yerevan already allow for the abrogation of international treaties. Deputies from the Armenian Revolutionary Federation, the other opposition party represented in the parliament, also criticized the amendments but chose to vote for them. “It contains necessary but insufficient formulations,” one of them, Artsvik Minasian, said before the vote. He said not only the president of the republic but also the parliament must be empowered to invalidate international agreements. The amendments were included on the parliament agenda just days after Sarkisian formally sent the two Turkish-Armenian protocols to the parliament for ratification. Leaders of the parliament’s pro-presidential majority have repeatedly stated that the protocols will not be put to a vote before their ratification by the Turkish parliament. I would much rather see them not ratified.